Flags and Banners – what does the Bible say? Throughout history flags and ribbons have been used in many significant ways – declaration and proclamation, worship, battle and celebration. 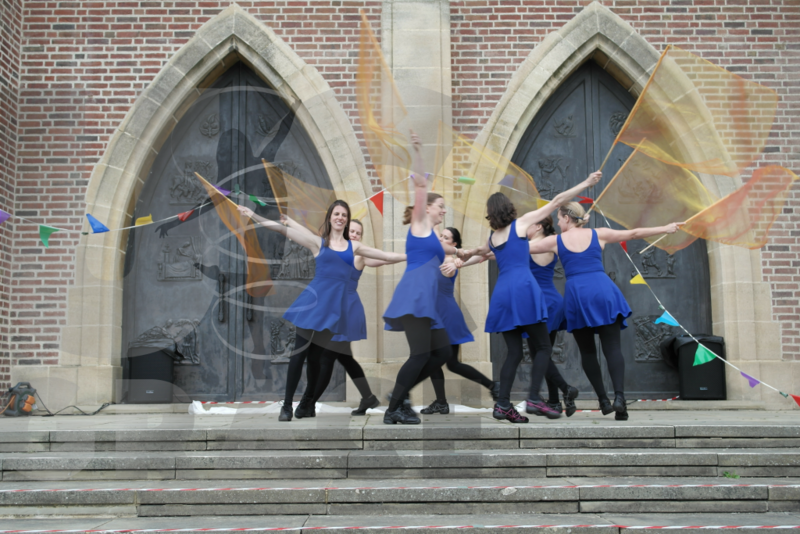 Flags have become increasingly popular in churches to demonstrate freedom of expression and encourage other people to experience and try out dance and moving with their faith. Flags and banners themselves have no power. The significance is in Scripture and what they symbolize, God ‘inhabits the praises of His people’ and brings the kingdom in when we choose to take them up in faith. However, I feel strongly, that flags and banners should not be picked up lightly. There is a lot more power in them, than people realise. They are vehicle to talk to God, to communicate, worship and share your heart. Be aware of this, as you choose to move with them. They were a people and a people belonged to God – there was Israel’s banner of God being with them. They housed the Ark of the Covenant, with them morning and evening. It was a symbol of God saying I am with you, just like we have the Holy Spirit. Demonstration of military and fighting force – each tribe had one rallying point for the fighting men of the tribes. They could look to the horizon and know the banner they need to get back to. Tribal unit identity – 3 on each side NESW, so they knew exactly where they belonged – their identity. Family clan units – based on the location of other banners, families always knew where to camp. The banners acted as reference points, therefore giving individuals purpose and vision. Tell people who you represent, but like a signal pole always high on a hill. This is very quick overview of the use of flags and banners, but hopefully offers you an insight into what the Bible says, and areas to think about when you choose to dance with flags. I like to remember it as a visual demonstration of a spiritual truth. Just like moving normally, you never know the impact moving with flags and banners can have on you and others who may witness it. The colour you use can create just as much impact. If you’d like to know more about ways that you adapt choreography to use flags here. There are also some tips on using ribbons in worship here. Finally, want to come try using resources during your worship? Then get in touch with me here to chat about me coming to your church, where you can try out ways of moving with flags, ribbons and material. No prior experience necessary! I don’t know about you, but from the moment you find out you’re pregnant all the ‘preparation’ that you are told about, explore, look up seems to centre on most of these topics – how your pregnancy will develop, how the baby grows, things you need to be aware of at birth, what to remember at birth, breastfeeding, bottle feeding, what changes the baby goes through and much more. What isn’t spoken about enough or made aware to mums enough is the reality of how you and your body feels physically post birth. When I had my daughter, this was the bit I struggled with the most, since then I’ve spoken with many mums about how they actually felt post birth and it’s shocking. It’s the one thing they weren’t prepared for, hadn’t been told or heard about, and it’s the thing that had one of the greatest impacts on them as they came to grips with being a new mum. 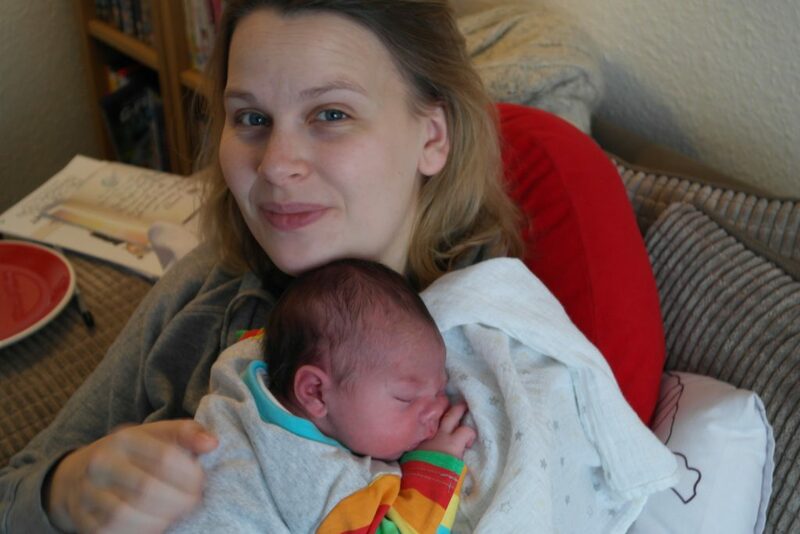 9 hours old – newborn snuggles once I could feel my arm! I want to share with you two things – my post birth pain story and how you can help yourself to get out moving after birth that will aid healing in the right way. I recognise everyone’s story is different, and for some mums, they may be the lucky few that experience a positive birth, with minimal visible damage and easy movement after. But sadly, there are a lot of mums that don’t get that. The birth of my first child wasn’t what I pictured it would be. To start with she was 10 days late! I was in slow labour, with sporadic contractions for 5 days. My waters broke but I didn’t have any regular contractions and I was scheduled to be induced. A high-powered walk eventually shifted things into regularity. 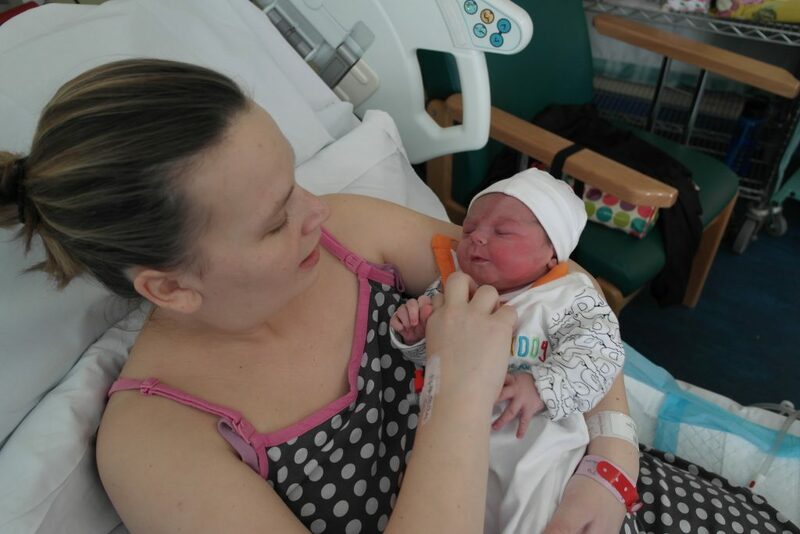 However, in the final pushing stages it all went wrong… very quickly, and I ended up in theatre with an episiotomy, forceps and a baby not breathing, after 6 very long minutes we heard our baby. Thank you, God. In the hours after the birth I eventually managed to get up, although I could walk, albeit very slowly, I could not sit. 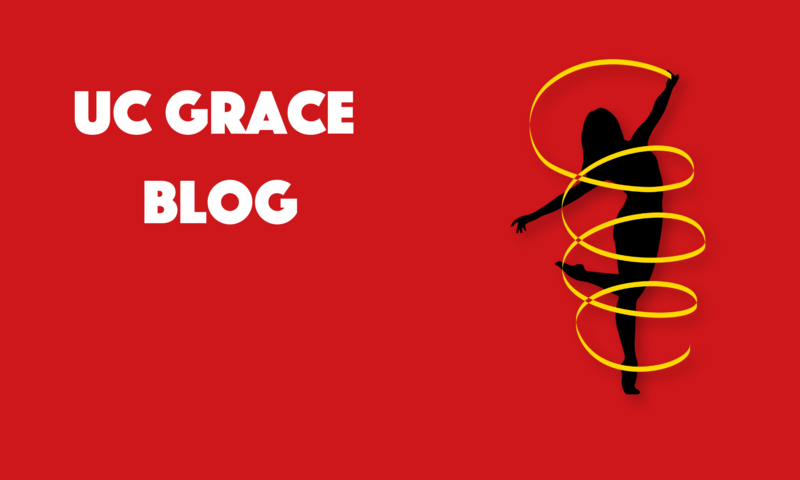 What followed as I attempted to recover, navigate a very painful breastfeeding journey (a story for another time), go through all the new mum, baby, family processes. Was the realisation that whilst I was prepared to ‘become a mum’, I most definitely was not prepared (nor had I read anywhere) for the immense pain, immovability and recovery of my body. The hardest part was transitions, once standing, or sitting in a fixed place I was okay, but moving from one to the other, turning over in bed, getting baby in the night to do feeds, was excruciating, it was at least 4 weeks if not longer before I could sit comfortably and transition between standing and sitting comfortably. 9 days – the tiredness has kicked in. Mentally I really struggled with this. I’m a doer, some one who likes to keep busy, and realising that I still needed to be on a ‘go slow’ a lot longer than I thought, I struggled with. It was around 4 months post-partum that my friend invited me to try out Buggyfit. What a God send! By this point I had worked out that sleep and my daughter didn’t mix. But the outdoors and buggy produced a small amount of sleep, hallelujah! Over the next 3 or 4 months with Helena at Buggyfit Farnham, I learnt a lot more about our post-partum bodies and rehabbing them in the right way. Plus, the importance of knowing if we have diastasis recti (tummy gap), and how strong our pelvic floor is (let’s be honest, we all mean to do the exercises, but the reality of actually doing them…?!). I took a lot longer to recover than I thought I would, in fact it hadn’t crossed my mind that it would take long to recover – I mean nothing is said in any of the magazines. But think about it, you’ve taken 9 months to grow your baby, allow it time to recoup, recover and regrow as needed. Fast forward to now, I’ve been a Buggyfit instructor for 3 years running classes in Odiham, Hook and Alton (more info here), I love it. I’m passionate about ensuring mum’s get moving in a safe, supportive and fun environment and I love being able to encourage them not only in their fitness journey, but also in being a mum. Slow and steady wins the race – giving birth is equivalent to doing a marathon, not only pace yourself during your labour, but also after it. No consistent* running, high impact, jumping, HiiT, Boxercise or similar until you are 5-6 months. This sounds like you must wait an eternity, but although you might look and feel great on the outside, there are many layers of muscles and healing that need to take place deep down. Follow the advice of your postnatal trainer but depending on your recovery some of these can be started sooner. Walking is the best place to start. Little and often – get out for a walk every day. This might mean on day one, you walk to the end of the driveway or garden and back and that’s it. But firstly, you’ve moved and secondly you got outside, win win! Fresh air helps you to regroup, blow away a little bit of tiredness and help you feel like you’ve done something. Moving, wakes up your muscles to help them to start contracting back to where they should normally be. Each time you walk, walk as fast as you can, this might be like a snail to start with, but you will get quicker! Remember your breathing – just like during labour, breathing is your lifeline. Taking several lots of deep breaths, a day will not only send more oxygen round the body to your muscles, but also help rebuild your pelvic floor and tummy gap. 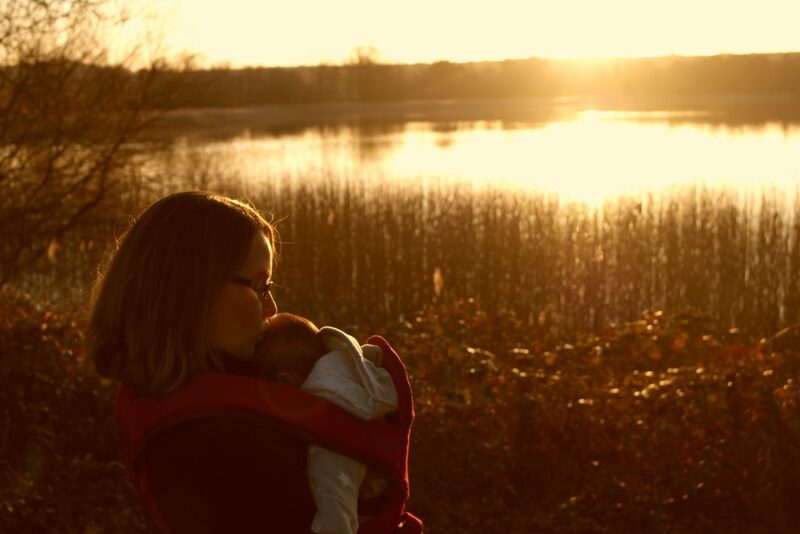 If you’re keen to get out and get moving soon after birth, then I’d recommend heading to a local Buggyfit class where you can get your outside fresh air fix, baby can go to and all the instructors are postnatally trained, so you will be in the safest of hands to get your body moving and active post birth. When looking for classes postnatally, it is really important that you check (ask to see certificates if need be), that your class instructor is qualified to teach postnatally. You will do more damage to your body if you go back into exercise and begin throwing weights around, doing sit ups, running sprints and more. There are many other exercises that work more effectively to rebuild your core, tone your muscles and build strength. Put your body first, let it recover, know that it might be painful and accept you might need to watch a little more tv whilst you recover! *Running for short bursts within for example, a set of circuits can be fine, but isn’t recommended before 12 weeks, at the discretion of the instructor depending on the mum’s recovery. 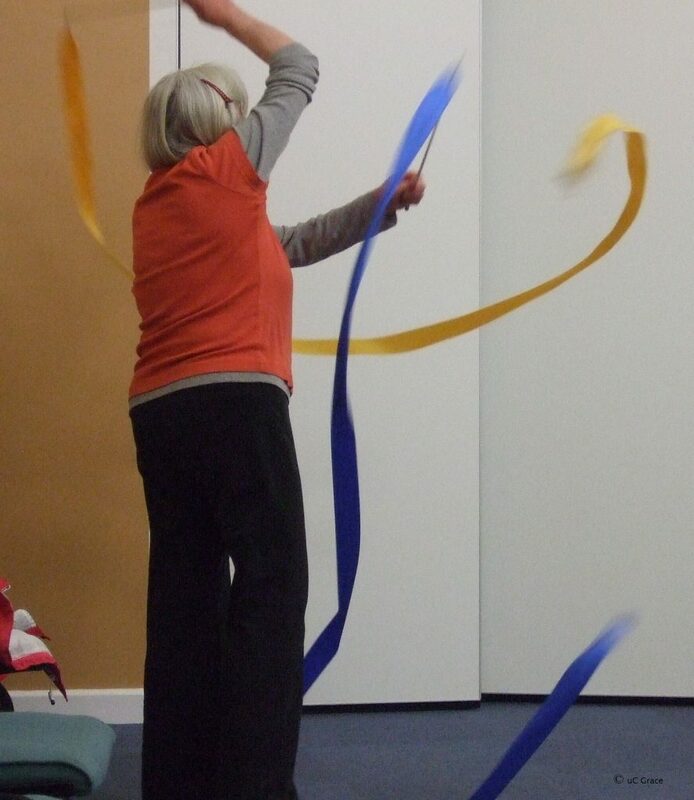 Ribbons are another way to bring colour and movement into dancing. Not only do they raise the eye level upwards, but the colour and the way the ribbon moves speak to different people in so many ways. There’re short ones, fat ones, thin ones, long ones, multilayer ones, it’s only your imagination that can limit the type of ribbon you can make and use. But just like with flags, there are a few things that you should always remember when choosing to move with a ribbon. It’s all about the wrist! The ebb and flow of the ribbon is created via the flex, rotation and flick of the wrist. It’s always best to hold the ribbon wand at the end to allow greatest movement and extension during your dancing. Much like with the flag, the ribbon is an extension of your arm, but unlike a flag, it moves, wraps, knots and twists a lot more easily. Clear precise movements of the wrist and body (!) help to maintain the ribbon in a place of hover and shape in the air. The length is important! As mentioned above, you can have ribbons in whatever length you want. However, I would say there are some exceptions. Children can operate a ribbon best under 2m, and I’d recommend 1m or even shorter (on a curtain ring) for children aged 2 – 5 years. Children will naturally want to move with a ribbon, instinctively they are drawn to it. But, their spatial awareness, movements and concentration can cause the ribbon to get wrapped up, knotted, hit someone and sometimes used a weapon or toy. For adults starting out I’d recommend starting at around 1.25m or 3m, no longer. You need to build up the strength and movement technique with your wrist before moving onto something longer. Some dancers move with up to 6m of ribbon, but the understanding and movement capabilities of the dancer is much greater. Dancing with a ribbon you can sometimes get stuck using the same sort of movements, but you have your whole body too. Unlike the flag, this lovely piece of ribbon really can mimic your movements in the shape it creates and the way that it moves. The video below demonstrates how ribbons can be seen up high, but also how their movements flow and sit well with how the rest of the body naturally moves. The dancers in this dance were from all different backgrounds, some with no dance experience, some with lots. In this instance the ribbons allowed everyone to be on the same level, take part and move together. So, they can be an excellent tool at drawing those who could be nervous, interested but not tried it, or have different abilities, together to move and dance as one. Do you use ribbons already? How did you find getting started with them, getting the movements from the wrist right and using your whole body with them? 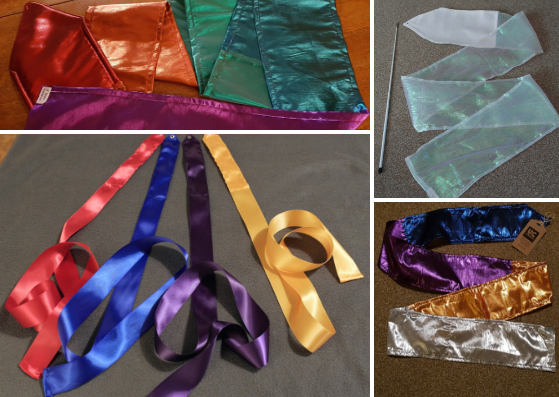 If you’re interested in trying out moving with some ribbons you can head here, where you can find some different colours and lengths to get you going. There are one’s available on curtain rings too, for the little ones. Pop back and let me know how you get on. Many people ask me how you can incorporate the use of flags into a dance without just simply twirling them. The simple answer is that you consider it as part of your body! I’m going to unpack some of what I mean by this. To begin with let’s talk about how you hold your flag and some simple movements you can do, to start to familiarise yourself with dancing with it. Flags (or banners) essentially consist of some form of rod and a piece of material. The exact make up of these two, is dependent upon your preference. I teach using dowelling as the rod and a rectangular piece of material, as I believe these offer a great foundation for beginners. When holding the flag, the ideal placement is thumb and index finger sandwiched around the base of the material where it is on the rod. This means that as you move the flag you can also untwist the rod if the material begins to get caught around it – I’ll be talking more about this later in the month. Initial movements with a flag involve circles, side ways figure of eights, ripples, throws, turns, rainbows and twists. Although with these you can travel and move them, they can be quite static in comparison to ‘dancing’ with the flag. So how can we move from a static place to incorporating fluidity with the flag? The flag is an extension of your arm – when you choreograph the flag sits at the end of the arm, which means that yes one arm is longer than the other, but that doesn’t mean your usual movements are inhibited. Moving with a flag brings Gods power – moving with a flag/ banner should not be done lightly, it’s an act of bringing Gods power down to earth in an almighty and visual way. So, know why you choose to use a flag and know that you are declaring Gods power in the process. Secondly, choreographing without a flag first makes adapting with a flag easier. In the video below I first choreographed, movements using my body alone. I went over and over these movements until I knew them well. Once that was done, and only then I picked up a flag to use within the already choreographed moves. Some of the movements naturally transposed to using the flag with them, others needed adapting slightly. It’s good to note that there are many ways to develop movement using the flag. But this is a way I would encourage for those that are not used to choreographing with flags. It allows dancers to see a difference between moving with and without, and the effect some changes can make in order to use the flag effectively. In addition, the more comfortable you get with moving with a flag, the more spontaneous your movements become, creating the fluidity you might see in others who are more experienced using them. I’d love to know what ways you choreograph and develop movement with flags? ‘Pictures say a thousand words’ I love this picture for so many reasons, but there as two main ones I want to chat about today. Are you a mud lover? Do you mind the mess it makes? 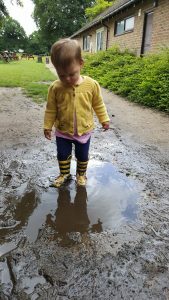 I’ve mostly embraced mud in my life, but when my daughter came along, I really had to learn what embracing mud, mess and chaos meant, as they are 3 things she loves! In our faith we can have an expectation that it will all fit into neat boxes and not be messy, but the reality is that it is rarely like that! Lots will splash up at us, getting us dirty along the way. Allowing our selves to live a ‘messy faith’ opens the doors to possibilities of connecting with family, friends and non-Christians in an unrestrictive way. God doesn’t want our faith put into a box, he made us to share it – the delight, mess, pain and laughter that can all come from it. Children have much less inhibitions than adults, which makes them much better at ‘just getting on with it’. They embrace things with their whole body, mess and all. So, when I talk about a ‘messy faith’ I’m referring to embracing God through those messy moments, when life might be hard and you don’t understand why life is like that at the moment. It’s seeing the joy in all circumstances, jumping in and getting messy too. 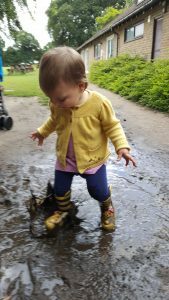 When my daughter discovered this puddle with her friend Theo, to start with they just walked through it backwards and forwards, and then did a little tap on the water here and there. When they realised the mess it made the look of shear delight on their faces was incredible. They both went a bit crazy and finished completely covered in mud (sadly no picture to show you the full extent!). This reaction can be what we experience in our faith. We go backwards and forwards over something checking it out, maybe testing the ground but never quite going all the way. We hold back. But, when you do make the decision to stop tapping and go in fully, what God gives you, is beyond what we can imagine. There is delight, there is comfort, there can be tears, but God carries us through it all. So, what things now do you need to embrace the mud in? What things do you need to be more childlike and push your inhibitions to the side? How important is advent to your family? 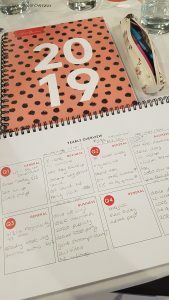 How often does Advent arrive and you feel like you weren’t ready for it, or you groan because that means that Christmas is going to sneak up really quickly and you still need to get x amount of things done first? In an effort to be a bit more organised I started thinking about Advent in October! Yes October! But mainly because my daughter is nearly 4 and really clued in to what is going on and already talking about Christmas! I felt this year would provide a great opportunity to develop further some of the activities that I already do during the Advent season. I really struggle with how secular advent has become, I feel you can get blind sided with all the ‘extras’ that seem to go with that time of year, particularly in the run up. God wants us to remember him in all we do and put him first, and that includes in amongst all the ‘extras’ that get thrown. So my questions to you, with December under 2 weeks away, how have you prepared for Advent? What is going to be your most important thing during the advent season? How will you celebrate it as a family? For me, I identify that advent can be such an exciting time and an awesome chance to explore not only the Christmas story but also ways we can pray, interact and move on our journey with God. This year to help, I have identified 3 areas to form the basis of our Advent time – Celebrate, Create and Explore. Celebrate – take a moment to find something specific to celebrate within our family, or something that Jesus did. Create – make something that will enable us to learn more about an aspect of Advent, the Bible and the Christmas Story. Explore – read a bit of the Christmas story and chat, move and go deeper with the themes from it. I’m looking forward to writing some ‘kindness elves’ activities (there’ll be more on this in another post), making HOPE jars, dove mobiles, and prayer bunting! All to help inspire imagination and generate conversation in our family. You can read some more ideas about how to explore advent as family from one of our free downloads, just fill in the form here. There will be a series of 4 available throughout the course of December. 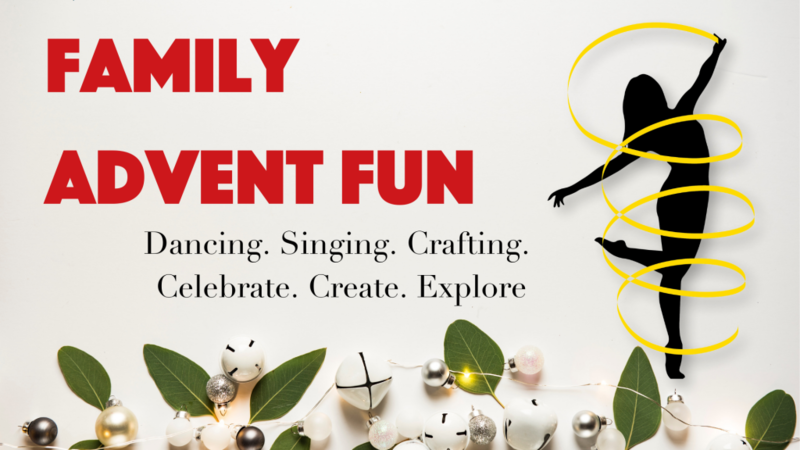 Don’t forget that there is also our Family Advent Fun event on the 1st December. Get into your flow and let momentum keep you going! 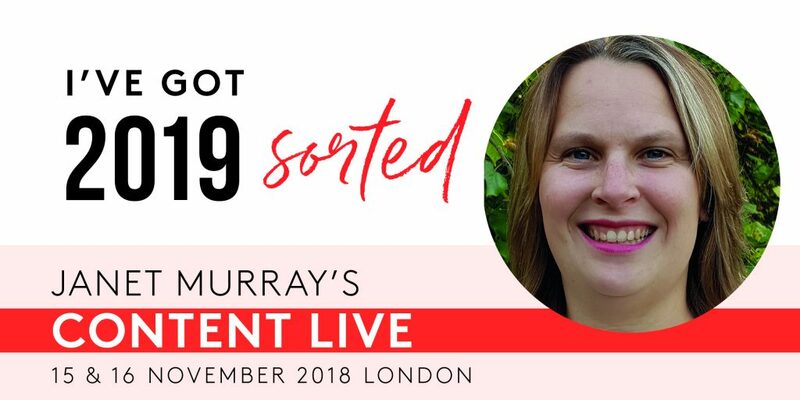 So last Friday I headed up to London to join day 2 of Janet Murray’s Content Live, I’m so pleased I managed to set aside the time to go. 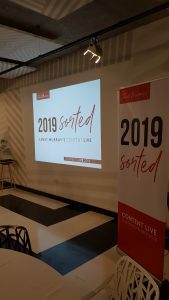 So many insights and good conversations, I’m going to do a round up and share whether I managed to reach the goals I set out in my pre-event blog. So I walked into a room full of people! But I did have the lovely Emma from Wordbee provide me with some moral support. I’d connected with Emma before the event, both sharing that we were nervous arriving on our own. Meeting initially outside Old Street tube station we had a short walk to the venue, so were able to have a quick share about who we were and why we were heading to Content Live. All the sessions were pretty outstanding; with Osmaan giving a great low down on our Entrepreneurial superpower and encouraging us that it’s all about getting into our flow, once you find the momentum that will keep you going, and make life easier! Amanda Webb from Spiderworking told us not to listen to the content gremlin (love that picture), and be ready to slay the things that get in the way. Throughout the day I had a great chance to chat with some lovely creatives, all looking for a different angle on how they could build and share their content more effectively. Two people that I had some interesting conversations with included Ramat and Rosie. Ramat primarily deals with helping customers generate the right business strategy via Ramat Tejani Marketing. However she introduced me to this fabulous new concept that she’s just launched called The Inspiration box. A place where you can draw inspiration from, have your curiosity ignited and be reminded of endless possibilities. Whilst Rosie, runs Mind, Body and Baby, which helps women to enjoy pregnancy and parenthood through hypnobirthing and therapy. It was great to be able to brainstorm some ideas with the lovely Alice (from Alice Sheridan Art), about how she could engage her big email list to respond to a call to action, as well as develop her online courses that she’s written further. Yay to automation! This is where the Mechanic in me got very excited. Let me just explain what I mean by Mechanic – this is my entrepreneurial super power. In essence Mechanics are good at finding ways to improve systems, making things simpler, perfecting projects and pay attention to detail. 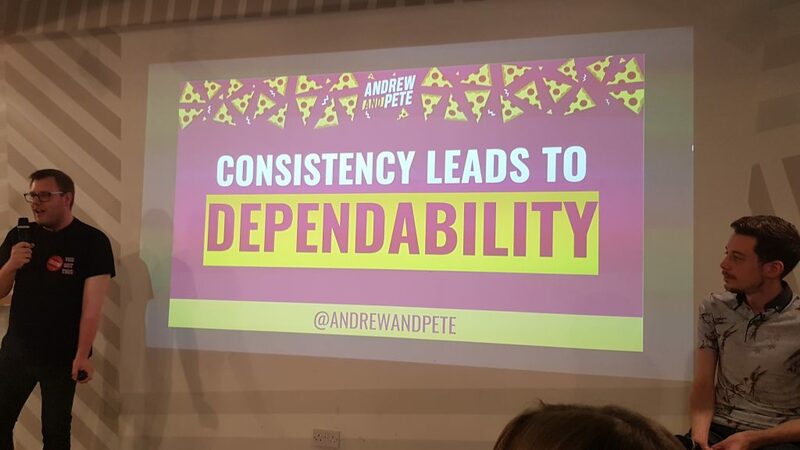 So when Andrew and Pete stepped up and started talking Spreadsheets – colour coded at that – there was a little inner squeal! 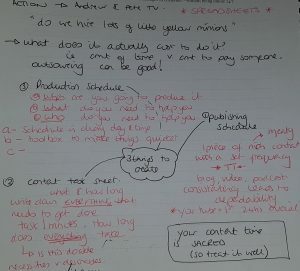 Essentially in planning content you need to create 3 things, a publishing schedule, content task sheet and production schedule. In other words, I’ve got to put some new systems in place, so I’ll be looking forward to working out the best way for this to happen. It was a great day, and I’m looking forward to continuing to get #2019sorted! Thanks Janet for organising such an awesome day. You can’t see God sometimes in the situation you’re in. On Saturday I had the chance to join Jubilee Church Flourish ladies weekend. A fantastic opportunity to receive and get some refueling for myself. Their theme for the weekend was ‘new wine’, how do you get new wine, wines have different labels depending on what they’re made up of, where they have grown and the soil they are in. To go alongside the theme was the Hillsong Worship song New Wine. 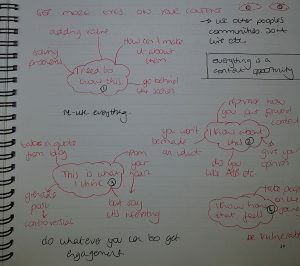 This was just one of the things that spoke to me when I joined them for the day. Powerful hey! What speaks to you first? For me it’s the chorus. There is such a pull on my heart strings, that I completely want to immerse myself into the words and the music. Let’s break it down into the different sections. God has given us an amazing gift, that can be shared, we are simply a vessel within which this can be done. Say to God that you want to give your whole self over to share His word and His story. Ask God to let you know what it is that He wants you to do. How can you use your passion to share with others, how can you build someone up in the work place, how can you use you whole self to share His word and story. It’s your opportunity to step out 100% and choose to trust God amongst all that is going on. He knows not only what you are capable of but also what your limits are. He won’t give you more than you can handle. Choose to offer your whole self to share His word and story. Jesus took it all away, we are drawn to our knees. All that we have we give. Share His word and story from your knees! God gives us more than we can fathom, more than we know. All the little things that go on, God knows about them and He puts them in place. Use your whole self, all your passions, dreams, gifts and life to share His word and story. Wow!! What could God do with you, if you’ve really been pulled down to your knees, you’re offering your whole self, acknowledging that God will give you all that you need to fulfill what He puts before you. What will come out of you?? More than you can imagine!! This song is definitely a keeper for me, and I am looking forward to finding an opportunity to dance my whole heart out to it!